How Did Nick Bosa Stack Up Against Joey? Nick Bosa arrived in Indianapolis knowing his every move would be compared to his older brother, Joey. After all, the Chargers’ edge rusher quickly established himself as a superstar over his first three seasons after being selected third overall in the 2016 NFL Draft. In fact, his 19 sacks through his first 20 games are the most by any player in history. Overall, Joey’s logged 171 tackles, 44 tackles for loss, 28.5 sacks and five forced fumbles since entering the league. His 28.5 sacks already rank 10th in Chargers history despite playing in only 35 regular season games. It’s hard for anyone to replicate that kind of production regardless of their last name. However, pundits believe Nick has the talent to do just that as most have him pegged as the first overall pick in this year’s draft. Still, while it’s natural to compare the two, Nick refuses to say they are in direct competition. However, while there may not be a sibling rivalry, that doesn’t mean there isn’t pressure to live up to the Bosa name, particularly with how quickly Joey established himself among the NFL’s elite. 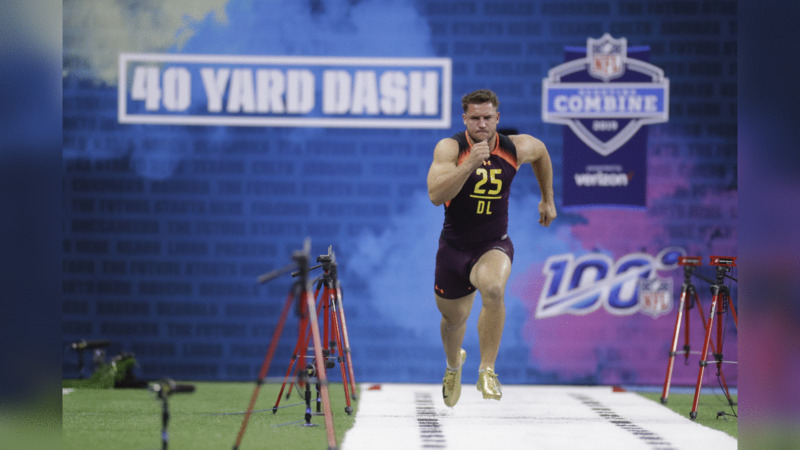 Ohio State DL Nick Bosa runs a 4.79 40-yard dash during the NFL football scouting combine on Sunday, March 3, 2019, in Indianapolis. Ohio State DL Joey Bosa runs a 4.86 40-yard dash during the 2016 NFL Scouting Combine on Sunday, Feb. 28, 2016 in Indianapolis. Ohio State DL Nick Bosa maxed out at 29 reps on the bench press at the NFL football scouting combine in Indianapolis on Thursday, Feb. 28, 2019. Ohio State DL Joey Bosa records 120.0 inches on the broad jump at the NFL football scouting combine on Sunday, Feb. 28, 2016, in Indianapolis. Ohio State DL Nick Bosa runs a drill at the NFL football scouting combine in Indianapolis on Sunday, March 3, 2019. Ohio State DL Joey Bosa runs a drill at the NFL football scouting combine in Indianapolis on Sunday, Feb. 28, 2016. Ohio State DL Joey Bosa runs a drill at the NFL football scouting combine on Sunday, Feb. 28, 2016, in Indianapolis. Ohio State DL Nick Bosa runs a drill during the NFL football scouting combine on Sunday, March 3, 2019, in Indianapolis. Ohio State DL Joey Bosa runs a drill at the NFL football scouting combine on Tuesday, March 1, 2016, in Indianapolis. Ohio Stated DL Nick Bosa runs a drill during the NFL football scouting combine on Sunday, March 3, 2019, in Indianapolis. Ohio State DL Joey Bosa performs a drill at the NFL football scouting combine on Sunday, Feb. 28, 2016, in Indianapolis. So, how did Nick stack up against his brother at the Combine? While it will be hard for anyone to match what Joey’s done so far in the NFL, he actually performed a hair better than his older brother did three years ago. The 6-4, 266-pound Nick ran a 4.79 40-yard dash and maxed out at 29 reps on the bench press over the weekend. Meanwhile, the 6-5, 269-pound Joey ran a 4.86 while notching 24 reps back in 2016. Nick was also a hair better at the vertical jump (33.5 inches to 32.0) and 20-yard shuttle (4.14 to 4.21), but Joey got the best of him in the broad jump (120.0 inches to 116.0) and three-cone shuttle (6.89 to 7.1). Of course, dominating the Combine and dominating on the field are two totally different things.  We often see people post extraordinary performances in Indy who don’t last long in the NFL as well as those who fail to measure up at Lucas Oil Stadium who then go on to have Pro Bowl careers. However, there’s no denying that there’s something special about the Bosa bloodline. With one brother dominating in the NFL and a father, John, who was a first-round pick in the 1987 draft, Nick boasts an unparalleled pedigree heading into the 2019 NFL Draft.